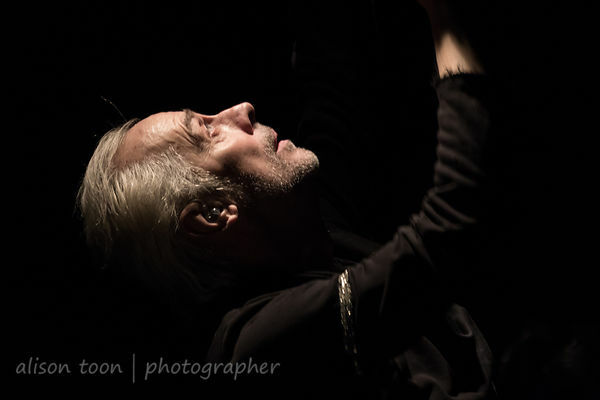 Peter Murphy brought his Stripped show to Sacramento last night, as part of the Stripped tour, which has gone from the USA to Europe, and now back here again. The venue was J Street's Harlow's: dark, cosy, and packed with people. Acoustic, semi-acoustic sets: some bands simply replace their usual instruments with unplugged versions, turn the volume down, play the same songs in almost-the-same-way-but-quieter. Not so, Peter Murphy and his band (Emilio China on violin and bass, and John Andrews on guitar). Instead, like a master chef, he reduces the songs to their very essence, and then builds them back up, enriching them with new flavours, bringing out the strength and character of the vocals over a delicate but strong and beautiful framework of violin, guitar, bass, backing tracks and Peter's occasional drums. This is an art form, and it makes for beautiful music. You know the songs, but you don't, and that's what keeps music alive. 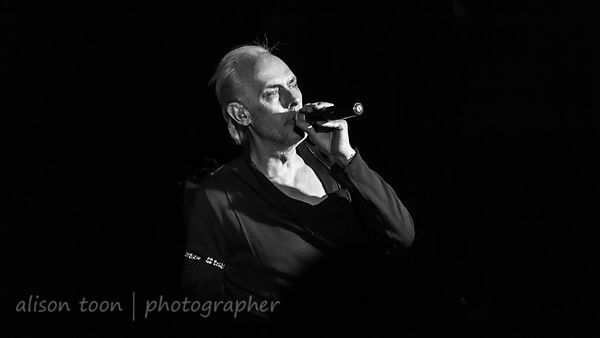 The show began with Peter Murphy sitting on a stool at the back of the tiny stage, guitar to stage left, violin to stage right, little-to-no lighting but for the occasional bright spot that lit up Mr. Murphy's shock of now-white hair. He remained on the stool for the first three songs (Cascade, Secret, All Night Long), then came to the front of the stage, playing to, and with, the audience. He's a singer, a songwriter, a comedian, and he's still the Godfather of Goth in many fans' hearts. 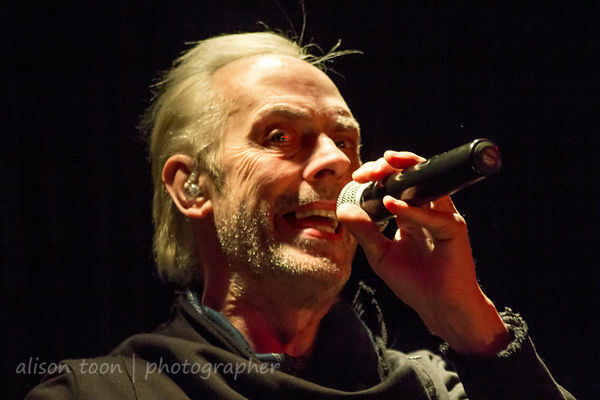 The setlist comprised a wide variety of songs from solo Peter Murphy albums and from his Bauhaus days: Indigo Eyes, The Rose, King Volcano, a cover of Bowie's Hunky Dory Bewlay Brothers, all interspersed with quite a bit of humour and a one or two British swear words. The tour continues: check the dates here: tonight in San Francisco, then over to the USA east coast. And fo more photos from last night's show in Sacramento in the photo gallery, click here!